Feelings are delivered perfectly when you send this Royal Enchantment 12 Roses Bouquet and spread your love in the lives of the people dearest to you. This mesmerizing Bouquet of Roses is filled with Fillers and presented in a Tissue. Tighten the bonds of your relationship by ordering online this Sweet Surprises 15 Roses Bouquet for your loved ones and give them a reason to love you more. This hypnotic Bouquet is added with attractive 15 Fresh Roses and Foliage tied in a Tissue. Tighten the bonds of your relationship by ordering online this Sweet Surprises 18 Roses Bouquet for your loved ones and give them a reason to love you more. This hypnotic Bouquet is added with attractive 18 Fresh Roses and Foliage tied in a Tissue. Tighten the bonds of your relationship by ordering online this Sweet Surprises 24 Roses Bouquet for your loved ones and give them a reason to love you more. 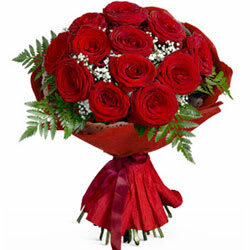 This hypnotic Bouquet is added with attractive 24 Fresh Roses and Foliage tied in a Tissue.